This movie had so much promise. 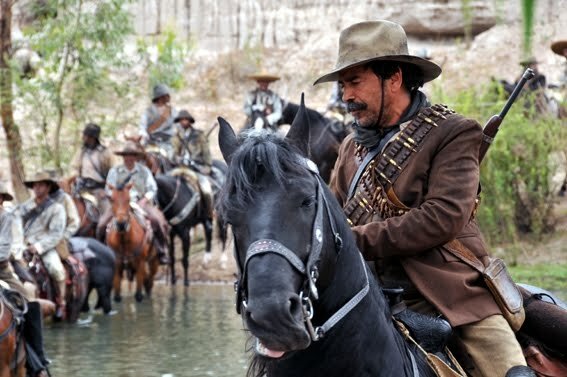 The premise of the movie intrigued me –the US Cavalry’s search for Pancho Villa through the border regions of Mexico. 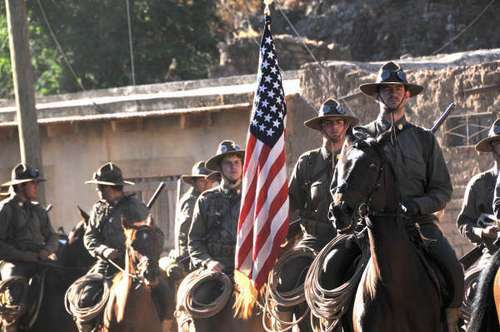 After Villa strikes Americans in New Mexico, the Cavalry set’s out on one of its last missions – to find Villa and crush his revolutionary social movement. All the elements were there – great historical backdrop, ripe conflict between two fundamentally opposed characters, and directed by celebrated Mexican director, Felipe Cazals. But my hopes were not fulfilled. In my opinon, Cazal’s determination to prove his political message cost him his credibility, and thus the movie itself. I get the idea – by showing the brutality of American retaliation to Pancho Villa’s attacks, the director could prove that the Iraq invasion, CIA torture tactics and Guantanamo Bay are only the newest manifestations of the inherently evil spirit of that big bully north of the border. I consider myself quite politically left of most people in America. I detest invasions, occupations, torture, or any of the other horrible by-products of geo-politics. But I still understand that every nation – the ‘bullies’ and the ‘victims’ – have both good and bad citizens. We are all human. But Chicogrande essentially portrayed Americans as universally ruthless, arrogant, and crude and every Mexican as ultra-resilient folk-heroes, martyrs, victims or noble saints. By failing to show both sides of each character, we were left with shallow puppets instead of intriguing, convincing characters trapped in the perils of war. For example, Major Fenton, the head of American forces, seldom spoke any dialogue that did not seem stolen from 1950s Soviet propaganda films. His motives were purely evil and sadistic. After using Fenton to display the ruthless evil of America, the director then poked fun at him by using some Mexican characters to shave off half of his beard and hair and steal his hat. Yet Major Fenton still rode around for the rest of the movie with a half a moustache and his hair a jumbled mess. That is simply unrealistic. In reality he would have shaved off the remainder of his moustache and got another hat to cover up his new haircut. But the director would not permit this. Instead, the American characters existed only to be ridiculed, while the Mexicans were glorified. The nail in the coffin came at the end, as the bemused Mexican villagers watch the Americans retreat across the border in defeat. The director actually has to use a few bystanders to echo his own beliefs. The old confused señora asks the rhetorical question, I wonder if they will ever come back again? A young, intelligent Mexican doctor says something like, No, they will be back. They will always keep us under their thumb and never let us grow. Why? Because they can. One of the principles of any good writing is “Show don’t tell.” Unfortunately, despite Cazals’ spending 90 minutes trying to show us what he thought about the US, he had to resort to using a mouthpiece to telling us directly what he felt we were too stupid to understand. I regret giving three negative reviews in a row, but Chicogrande was inarguably a grand disappointment. Skip it.